In business since 1985, CCT Express Freight has plenty of years’ experience in express freight, warehousing and distribution. The company has grown over the years, largely due to the recommendations of satisfied repeat customers. CCT Express Freight now employ a number of drivers, some of which are specialised drivers, trained to carry AirFreight and hazardous goods. The fleet includes panel vans, 7.5t trucks, 18t trucks, 26t trucks and 44t tractor units. 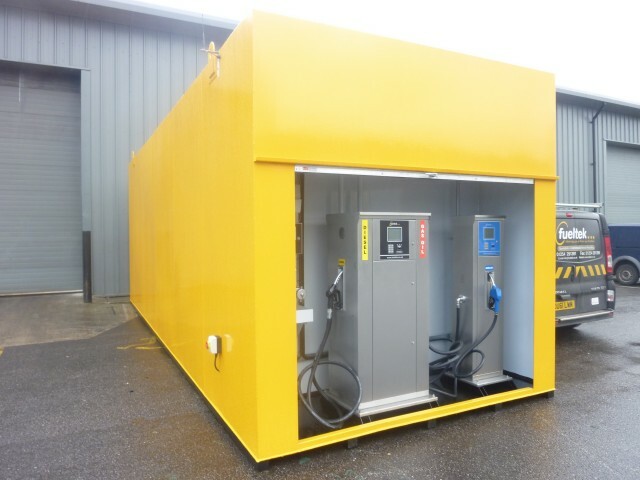 Fueltek were approached by CCT Express Freight to install a fuel management system and tank management system as well as a sizeable fuel storage tank. Using our knowledge of the client and their requirements, we installed a 45,000 ltr fuel storage tank, a one-off FT4000AP Twin and TankWatch two probe – diesel and AdBlue. Each of these solutions offers a range of benefits for the company. Firstly, the fuel storage tank is a safe and secure way of storing fuel onsite at the same time as providing a way of saving money. When installing a fuel storage tank on any site, we first assess the needs of the client, then make a decision as to the size of the tank based on their requirements. The FT4000AP Twin is an integrated fuel pump and fuel management system which offers complete control to the company over their fuel use. The equipment allows the company to access information regarding their fuel consumption anywhere, as long as they have an internet connection. The TankWatch system is there to help the company use their fuel more efficiently, helping them to save money as well as be more environmentally friendly. Through the use of probes inside the fuel tank, the system is able to track fuel use easily and accurately. We are extremely pleased to see another happy customer begin a more cost-efficient, effective and environmentally friendly way of managing their fuel. If you are considering the need for effective fuel management in your own company, we would be more than happy to discuss your requirements with you. Please don’t hesitate to get in touch with a member of our team by calling 01254 291391 or by emailing sales@fueltek.co.uk and we will be happy to help.